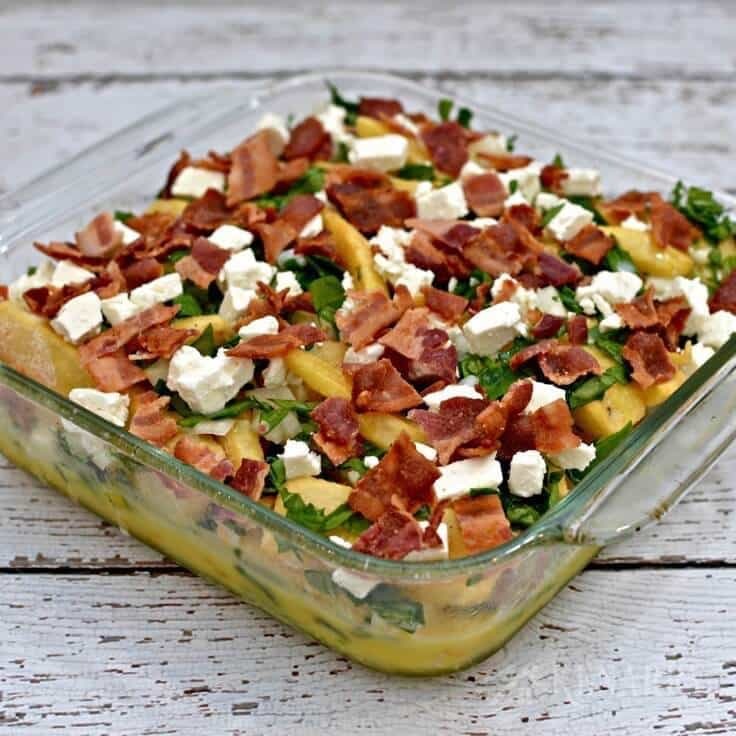 This overnight egg casserole recipe uses crispy bacon, fresh spinach, feta cheese and frozen french fries for a delightful breakfast your family will love. Looking for a unique and special make-ahead breakfast idea to make for your next brunch? 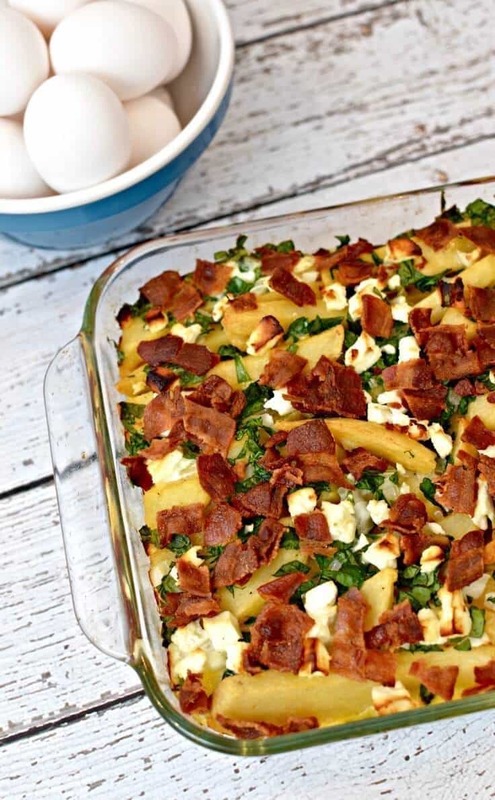 Today, we’re sharing an amazing recipe for Bacon, Spinach and Feta Breakfast Casserole. I love breakfast, but I hate fussing in the morning when I’m groggy with sleep and haven’t found a cup of coffee yet. I naturally gravitate to any egg casserole recipe or breakfast idea that you can make the day before and store in the refrigerator overnight. Heck, I even have a recipe for breakfast enchiladas that I’ve made weeks in advance and put in the freezer. When the weather is nice, we spend a lot of time up north at our cottage which is right next door to my parents. My dad and I have gotten in the habit of taking my dog, Scruffy, for long three mile walks on Saturday mornings. When I get up to the cottage on Friday nights, I quick whip up an egg casserole recipe of some kind and put it in my parents’ refrigerator. In the morning on Saturday, my dad throws the casserole in the oven before we hit the road for our walk. By the time we get back everyone else has woken up for the day and the egg casserole is cooked and ready to eat. It’s been working out perfectly. We’ve been in the habit of doing this for long enough now that I’ve started to get a reputation in my family as the queen of breakfast casseroles. The egg casserole recipes I make are hardly ever the same from week to week. Some times I use cubed or shredded hashbrown potatoes, some times I use ham or sausage, some times I make a pizza breakfast casserole or a french toast casserole. You just never know what I’ll throw together! I like to get creative with the ingredients I use in an egg casserole recipe so it doesn’t get boring or start to feel like you’re eating the same thing all the time. There are really only so many ways you can use ham and cheddar cheese for breakfast, right? 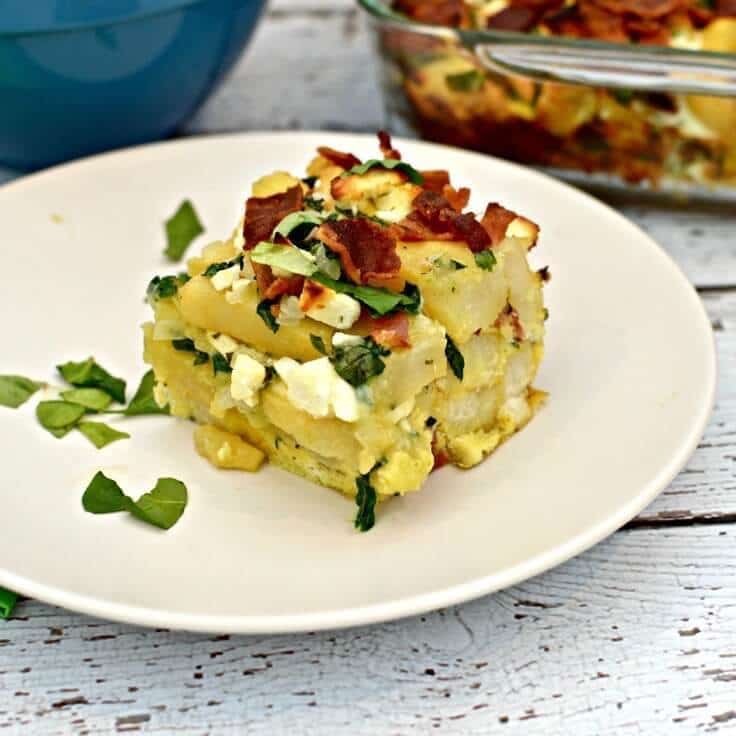 I got inspired to make an egg casserole recipe with bacon, spinach and feta cheese since I love how those flavors blend together and rarely think about using spinach or feta in my egg casseroles. While looking at hashbrown potatoes in the freezer section at my grocery store, my eyes wandered over to the frozen french fries. Hmm… I’ve made egg casserole recipes with tatertots or small crispy rounds before, but never french fries. 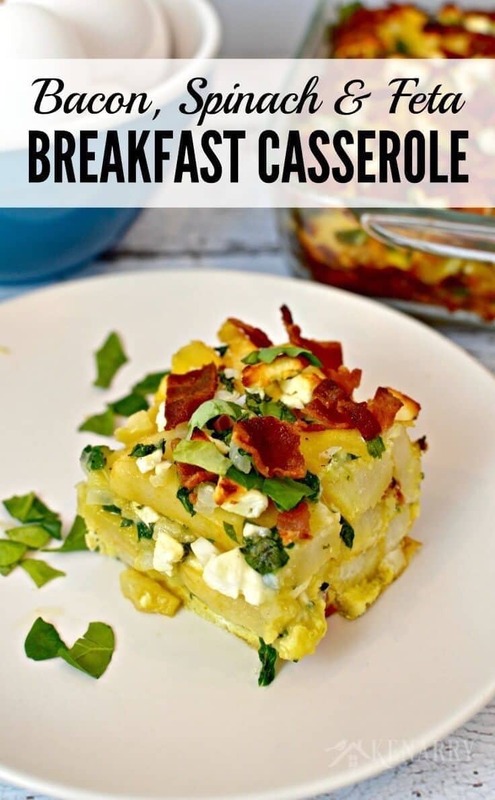 I couldn’t imagine why they wouldn’t work just as well in a breakfast casserole as the tatertots or hashbrowns do and decided to give it a try. 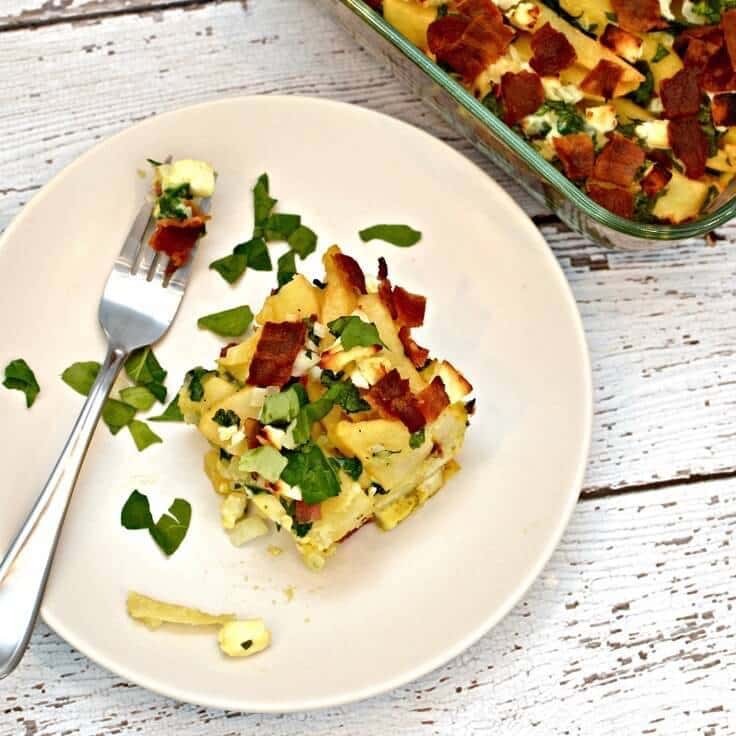 It’s pretty simple to make this egg casserole recipe. 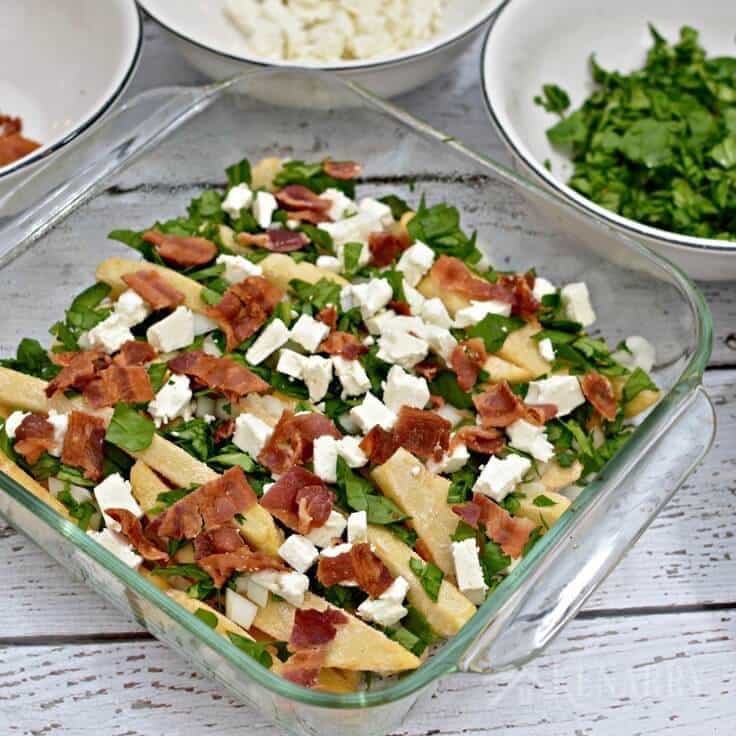 You’ll find the full recipe below, but basically you start with a layer of frozen french fries, then half of the diced onion, crispy bacon, crumbled feta and fresh spinach. Then spread a second layer of french fries and sprinkle with the remaining onion, bacon, spinach and feta. Beat together some eggs, milk and a few spices to pour over the Bacon, Spinach and Feta Breakfast Casserole. When you’re done, put it in the refrigerator overnight. 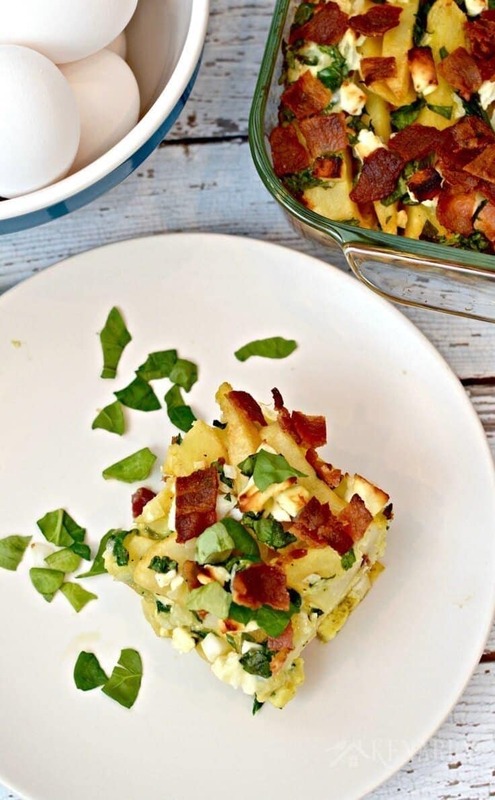 In the morning, throw the Bacon, Spinach and Feta Breakfast Casserole in the oven then go for your walk, have your morning cup of coffee, watch the news or whatever you want to do. Once the egg casserole is fully cooked you can serve and enjoy! Lightly grease an 8 x 8 pan or 2 quart baking dish with cooking spray. Spread half of the steak fries in the bottom of the baking dish. Layer half of the feta, bacon, spinach and onion. Top with the remaining steak fries. Sprinkle with the rest of the onion and spinach. In a medium sized bowl, whisk together eggs, milk, pepper, salt and garlic powder. Pour over the breakfast casserole. 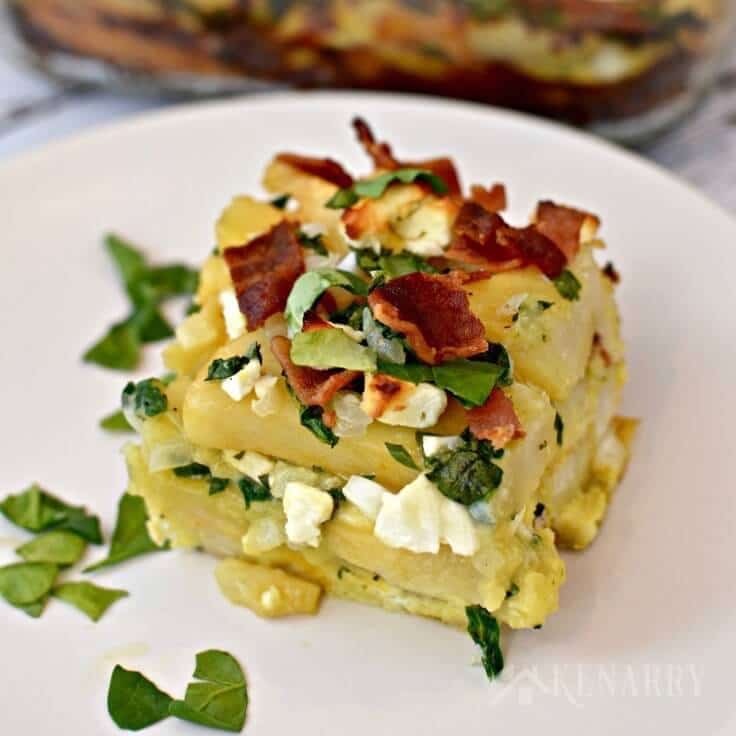 Top with feta and bacon, then refrigerate overnight. In the morning, bake at 350 degrees for 60-70 minutes or until eggs are cooked. Enjoy! Instead of frozen french fries, you can use cubed or shredded frozen hashbrown potatoes. You could also use tatertots or crispy rounds. There’s just something about tatertots that my whole family raves about when I use those in a breakfast casserole. The egg casserole recipe is pretty dense with the french fries. If you like your breakfast casseroles to be eggier, you could cut the amount of french fries in half. Replace the bacon with diced fresh tomatoes if you prefer more of a vegetarian egg casserole. Top your egg casserole with store bought salsa or homemade pico de gallo for some added flavor. 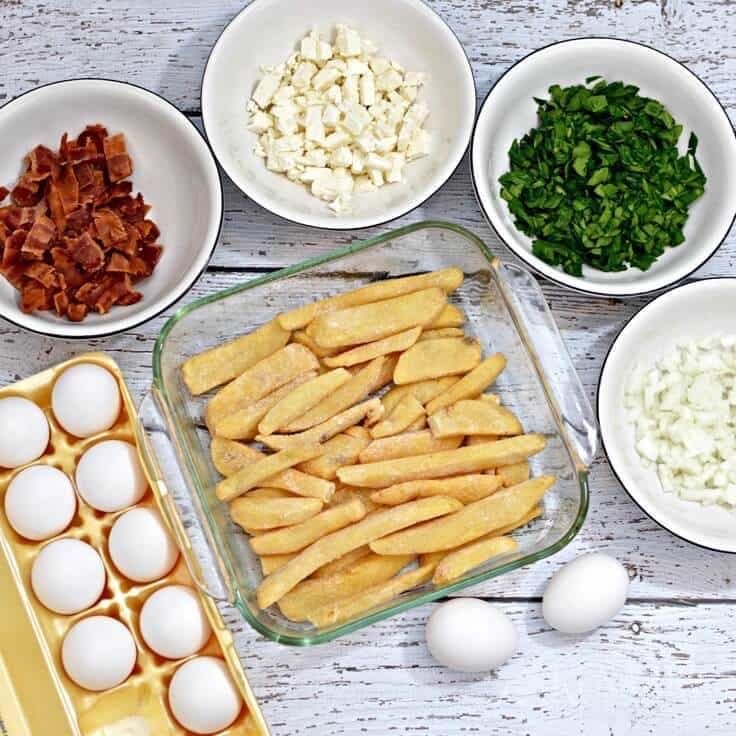 What are your favorite ingredients for an egg casserole? Please comment below and share. We’re always looking for new breakfast ideas! 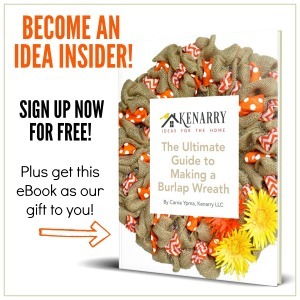 When I saw the picture I thought – wow that looks so good – and then I read the post and thought – wow that looks so easy!! – I mean just wow! Thanks for sharing on the What’s for Dinner Link up! Awww, thanks Helen! Glad you enjoyed the recipe — it is incredibly easy to make. You’ll love it. I’m a huge fan of breakfast casseroles! Sharing and saving this one to try. Me too, Shelley! Hope you love this one.